Recent relocation of Jaffna bus terminal to Pannai by Sri Lanka Army (SLA), and overflow of traffic along outer peripheral roads due to reconfiguration of traffic flow including prohibition of parking, have created additional burdens to families from the islets entering and leaving Jaffna town, civil society leaders said. Restrictions of intra-islet travel, and of transport in interior land routes have added further hardships for the people in these areas. More than 50,000 civilians from 14192 families reside in the main population centers in the islands of Kayts, Karainagar, Velanai, according to a report from the welfare centers in the islets. The statistics include: Velanai - 17460 people of 4709 families, Kayts – 15147 people of 4388 families, and Karainagar – 10687 people of 3381 families. 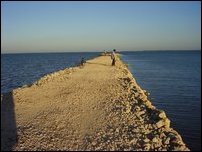 The Kurikattuvan jetty located in Punguduthivu connects Neduntivu, Nainathivu and Analaithivu. 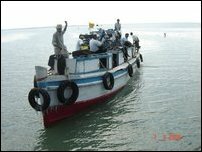 With intra-islets ferry service limited by the Sri Lanka Navy (SLN) for the past few weeks, residents of the islets of Analaitivu, Eluvaithivu, Nainativu and Delft (Neduntivu) in the Northern archipelago are facing greater difficulties without means of obtaining their basic needs, the sources added. The distant- most Delft Island's Mavilathurai jetty is served by a single boat trip in the morning and the passengers are stranded in the island until the return trip in the following morning, the sources said. 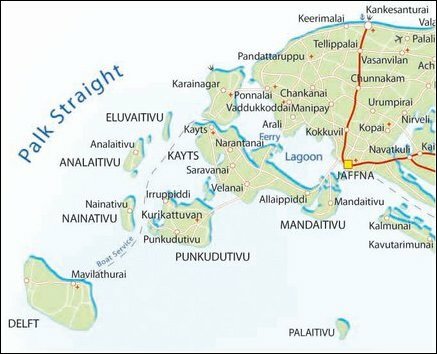 To add to the woes of the residents in the main islets, the transport by land too has been restricted to a single trip and as a result the vehicles proceeding to Kurikadduvan via Velanai and those traveling directly to Kayts in the morning are able to return only in the afternoon seriously hampering the free movement of the civilians during the day, civil sources said. Passengers through the land route have complained of severe harassment and intimidation by the Sri Lankan Navy manning the check points, and residents are scared to travel other than for urgent needs. This has further worsened the plight of islet residents forcing severe economic hardships, deprivation of medical needs and hampering of educational activities, the sources complained. Visits of Sinhala pilgrims to the Buddhist shrine in the island of Nainathivu, which increased MOU was signed after remaining low for almost two decades, have come to a complete stop with the closure of A9. But the pall of Sri Lanka Navy presence continues to cast a shadow on Tamils who are still subjected to checks and regulations. The islets were terrorized in May this year when twelve residents of the islets were killed in two separate incidents. Sri Lanka Navy (SLN) troopers from Mandaithivu camp surrounded a civilian house in Allaipiddy in Mandaithivu islet, on 13 May this year, and opened fire killing 8 civilians. The same day three civilians belonging to same family were killed at their home in Puliyankoodal in Kayts by Sri Lanka Navy operated paramilitary gunmen while a tea-shop owner was also found shot dead near Velanai junction. Kayts district court Judge, Mr. Jeyaraman Trotsky, who rebuked the Criminal Investigation Division (CID) for attempting to coverup the Allaipiddy investigations. Eighteen years ago, thirty eight Tamil passengers, travelling in boat called ‘Kumudhini’ from the island of Delft to the Kurikkatuvan Jetty on the island of Punguduthivu were hacked to death at sea by armed persons suspected to be Sri Lanka Navy personnel. Colombo took little interest in investigating the case, which was shelved after being taken up in the Jaffna courts briefly.